Car Dealership Salespeople – Not to be Trusted? We asked the British public how trustworthy they consider car dealership salespersons to be. We recently carried out a study asking the British public to rank different professions by how trustworthy they consider them to be. The roles we listed ranged across the sectors and while jobs like doctors and pilots were deemed very trustworthy, the news wasn’t good for car dealership salespersons, who came bottom of our list. When we drilled down into this and asked those involved in the study to explain why exactly they consider car salespeople to be so untrustworthy, a few unsavoury adjectives came up. Beyond the words that perhaps aren’t safe to publish, the most common examples included: sleazy (21%), patronising (17%), confusing (14%), deceitful (13%), rude (11%), and unhelpful (8%). As well as this, almost a third of the people we asked claimed to have had a particularly ‘bad experience’ at some point. Often this led to them feeling pressured to buy, or to feel that they were being lied to and ‘ripped off’. One of the main gripes people had was with the jargon and clichés they had to endure when conversing with a car salesperson – or their BS* (*Big Sell) as we’ve called it. As much as 61% of people claimed to have experienced this, with 39% claiming their respective conversations with dealers featured a ‘significant’ amount of BS* phrases. The specific examples varied from person to person, but invariably people quoted phrases like ‘best price’ and how whatever vehicle they discussed was regularly referred to as a ‘reliable’ model. Those we asked also referenced being pushed towards the seller’s insurance and warranty offers and felt they were being coerced to doing a deal there and then. As a provider of GAP Insurance, we know for a fact that dealers will try to push their more expensive policies from partnered providers, rather than giving an objective view, or pointing out there are cheaper alternatives like us – despite FCA regulations implemented in September 2015 requiring dealers to inform customers they can buy GAP Insurance elsewhere. In addition to this though, we wanted to provide a few more examples of car seller BS*, so we conducted some first-hand research and visited several dealerships to speak to different salespeople. Using our research from the conversations we had, we then collated the most-common phrases and jargon into a chart we’ve called the ‘Car Dealer BS* Bingo’ card. Our aim with this being to provide people with a useful means of recognising and avoiding any underhanded ‘Big Sell’ tactics when they are looking to buy a car in the future. We also went one step further by placing this mobile ad on a truck and taking it to various offending dealerships to call them out directly on their BS* (Big Sell) tactics. 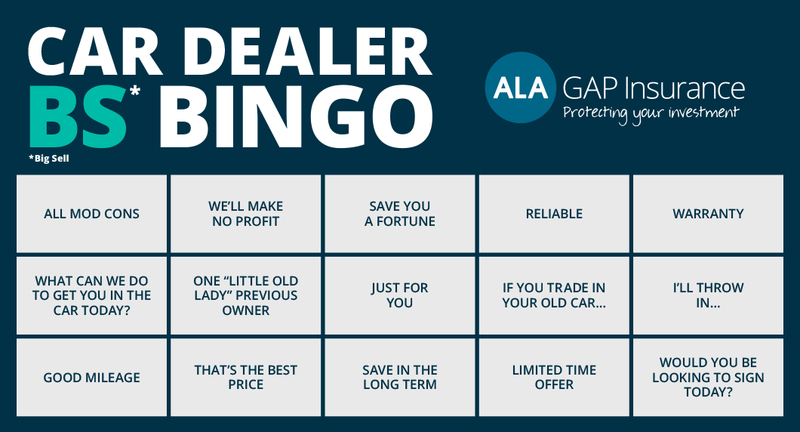 Hopefully our bingo card will help those in the market for a new motor to find better deals on everything from car finance to GAP Insurance – it may even make car salespeople more open and honest once they realise buyers are a little savvier than they first thought. It’s also worth us pointing out that there were a few other professions which also didn’t do so well in our trust rankings, which people may want to be wary of in lieu of any future dealings. We asked respondents to rank a range of professions on a trust scale of 1-10 (1 being least trustworthy, and 10 being the most), and worked out the average to give each profession a “trust score”. With all this in mind, if you feel you’ve been ripped off or misled by a car seller before, you can now feel some comfort in the fact you’re not alone. More importantly though, you can use what we’ve discovered to be more aware of dealers’ BS* tactics, and hopefully now avoid them in the future. There’s another type of GAP Insurance?